also known as the prettiest color of smoothie. i want all my smoothies to be JUICY JUICY. not icy and bland. but, i recently had a revelation. just because you're adding as much fruit as you can possibly fit to the tippy top of your blender, it doesn't really mean it's that much healthier for you. that's actually a ton of sugar. natural sugar, still, but an overdose! so, your ratio of greens has to be huge to balance out the fruit sugars. or you might as well just go have a milkshake! kidding, but think about it.... you'd never sit down and drink a tall glass of orange juice, eat 2 bananas, 1/2 a pineapple, 8 strawberries, whateverwhatever..... but somehow if we're able to blend all those items into smoothie form, it makes it all "okay" and actually, "supa healthy!" which is probably not the case at all. anyway, i've just been more aware of the greens to fruit ratios lately. i find that a mixture of orange juice and pomegranate juice makes for the j u i c i e s t smoothies. i also always add a bit of ginger to my fruit smoothies because i love it and feel like it heightens the juiciness factor - but if ya hate it, skip it. the gourmet gardens ginger paste is super delicious and much easier to deal with than real ginger, so i love using it in smoothies. it speeds up the process a lot. people say you don't necessarily have to peel fresh ginger to use it, but i don't like the hard skin chunks so i always take the time to peel it. pete & i also use the gourmet gardens garlic paste when laziness strikes in the kitchen - so, all of the time. ha! you want the greens to make up at least 50% of the smoothie, or else it's kind of a fruit sugar overload. spinach has essentially zero sugar. you can't even tell theres at least 2 heaping cups of greens smashed in there, and you can't taste it either. dat stealth 4 your health. i plopped some fresh raspberries in the finished product as well. they're a fun little smoothie surpriZe when you get 'em. In a high speed blender, add the juices on the bottom and the remainder of ingredients on top. Blend on high for 2-5 minutes to pulverize the spinach or greens. Taste occasionally and add extra raspberries or pomegranate juice if necessary. you know its summer when you eat a big fat yellow peach and have juice dripping down your chin and down your wrists. that sounds gross when writing it out, but you know the feels! or how bout a red plum! that too! peaches are sooo primo right now! yum yum juicy juicy. 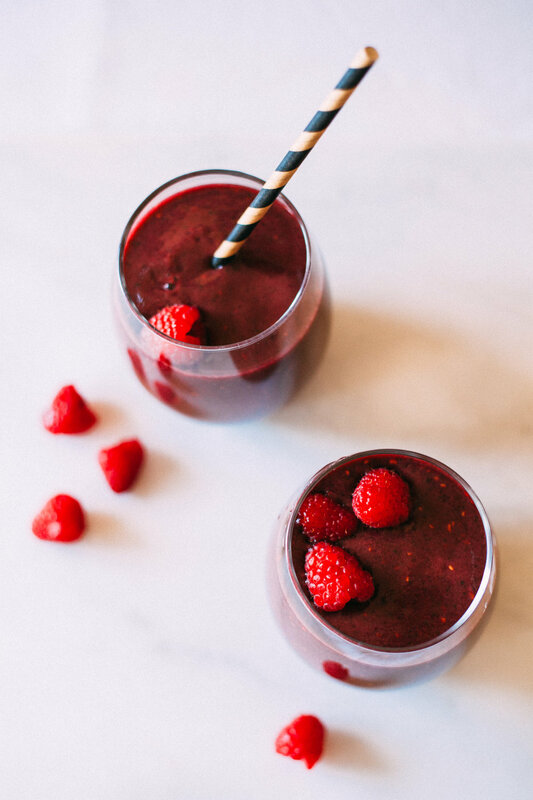 i wanted to make a super simple smoothie, and to make it extra summery! enter fresh summer peaches and strawberries. add some banana for texture, lemon juice for citrus zing, spinach for extra fiber & sneaky veggies, and coconut oil for that extra hint of summery vibes. if you love coconut flavor, you will love coconut oil in your fruit smoothies. it adds the ever so slightest hint of coconut and its SO GOOOOOD. and light and refreshing. the thing about using just a little bit of spinach in your smoothies is that it always turns out brown. wah wahh. use a lot of spinach and it will turn out a very pretty green! i usually blend my smoothies for super duper long, like 5 minutes. haha. kind of overkill. but i want them to be extra smooooooth. i have a ninja blender and it works pretty dang well. i have never used a vitamix, but i bet it pulverizes all those tiny strawberry and spinach particles into smooooothie goodness. don't forget dat coconut oil. it's like a little tropical island daydream in a glass. aaaaaah coconut oil smoothie take me awayyy. Wash all the fresh fruit. Cut off all strawberry stems, cut the peaches off their pits, and peel bananas. Place all ingredients into a blender. 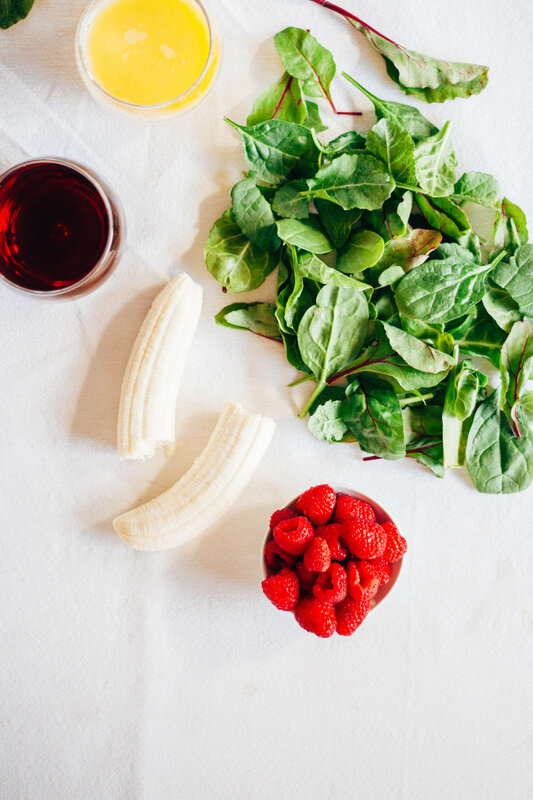 Blend until spinach and strawberry are chopped up as finely as possible and the mixture is super smooth. Add the ice very last and blend again.